Whisk together all ingredients in a small bowl. Cover and refrigerate 1 hour before serving or overnight. Every year we have a decade themed movie marathon and eat food that was either introduced during that decade or that was very popular. You can read more about it here. This year we watched movies from the 1950s so I made '50s food. Normally I only make snacks and dinner but this year my husband took off work and I made a '50s lunch to eat while we watched The Blob. Ranch dressing is one of the (food) inventions of the 1950s that remains the most popular today. 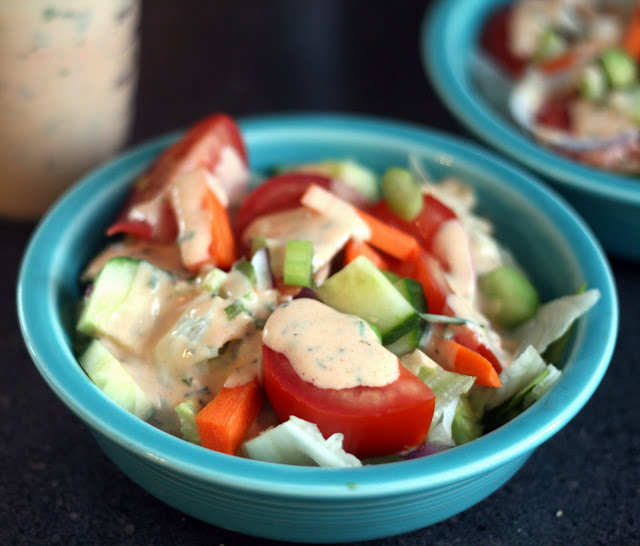 A variation on classic buttermilk dressings, the dressing was very popular with diners at Steve and Gayle Henson's California dude ranch during the 1950s. It became so popular, the ranch stopped making any other kinds of salad dressing for their guests. The owners of the ranch eventually started selling a herb mix so their customers could make the dressing at home by simply adding buttermilk and mayo. The couple sold their company in 1972 and since then, the dressing has evolved to the shelf stable bottles and add just add milk dry mixes sold today. While the store bought stuff is convenient, as is true with so many packaged foods, the homemade version is so much tastier! Luckily it only takes a few minutes make and keeps for up to a week in the refrigerator. I love the fresh taste it gets from the mix of spices and herbs and how creamy it tastes even if made with lighter mayonnaise and low fat buttermilk.